Implants? Crowns? Veneers? Invisible braces? As dental technology and services have expanded in the Seattle area, so has the vocabulary. Dentistry has advanced to provide many new solutions that address almost every possible dental trouble. Dr. Brian McKay has expertise with cosmetic and prime restorative care. In the past, if a patient in Seattle had a missing tooth or a severely damaged tooth, dentists regularly suggested dental bridges or dentures, because they were the best options at the time. 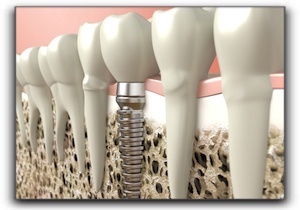 These days, innovative dental implants have proven to be superior to dental bridges for most patients. They can also replace dentures or anchor dentures for some patients. Longevity – Dental implants are strong and permanent, meaning with proper care they can last ten years or more. Seamless – Fabricated to have the same shape, size and color of the original tooth, the implant will blend seamlessly with all the other teeth. If the original tooth had aesthetic issues, these can frequently be fixed with the implant crown. Function – A dental implant functions like a natural tooth allowing for normal eating and speaking. Convenience – Unlike dentures, no adhesives, rinsing, or removal is required. Independent – Like the missing tooth, the dental implant is treated individually. No damaging of adjacent teeth is required, as with dental bridges. This independence allows nearby teeth to remain intact. Cleaning is easier than with most dental bridges which can require the threading of floss under and around the artificial tooth. If you are interested in getting a tooth implant, call Advanced Cosmetic & Laser Dentistry at 206-720-0600 to schedule a tooth implant consultation. dentist McKay practices in the greater Seattle area from Advanced Cosmetic & Laser Dentistry in Seattle. Dr. McKay will complete an exam, take x-rays and counsel with you. If it is determined that you are a good candidate for the procedure, the process will begin. Plaster dental impressions of both upper and lower plates will be taken. dentist McKay will correctly place the titanium implant, which looks like a dark screw, into the bone of your jaw. Over the next couple of months, the bone and implant will bond together to form a new root for your new tooth. After the needed time has passed for bonding of the bone and implant, an extension (called an abutment) is placed on top of the initial implant post. This post extension is then capped with a temporary tooth. Meanwhile, the team of professionals at our lab will customize your new, permanent crown. Dr. McKay will then put the attractive permanent crown on top of the full post. This tooth will match your other teeth to create an exceptional new smile. You will find that the comfort is the same as your natural teeth, to the point that you may even forget which tooth is the implant. The upkeep is the same, with brushing, flossing, and regular check-ups needed. If you want to identify if a tooth implant is right for you or desire information about smile transformations, call Advanced Cosmetic & Laser Dentistry for more details. Use the form below to ask a question about Replace A Missing Tooth With A Durable Dental Implant and one of our expert team members will get back to you shortly.